WAND is proud to announce the launch of another new title in its foundation taxonomy library - the WAND Local Government Taxonomy. 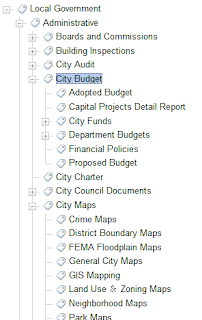 Designed specifically for city, county, and other local municipal government organizations, the Local Government Taxonomy includes 1,224 categories with 110 synonyms for important local government functions, documents, forms, fees, and more. Top level concepts include Administrative, Culture and Recreation, Economic Development, Elections, Facilities, Information Technology, Judicial, Municipal Personnel, Public Safety, Public Welfare, Public, Works, Revenues and Financing, and Transportation. 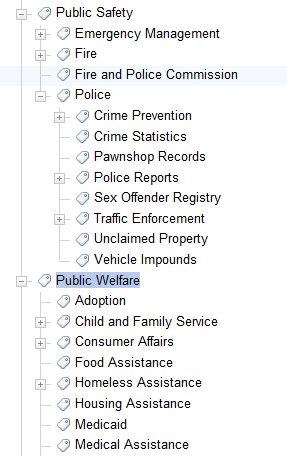 The WAND Local Government Taxonomy can be used by a local or city government to jump start a taxonomy project. 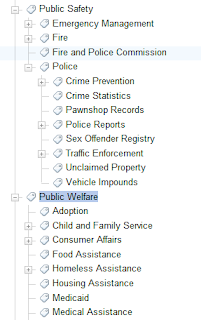 Once installed in a document management software, such as SharePoint, Oracle Webcenter, Documentum, and many others, the taxonomy can be customized with terms that are specific to any specific municipality and then is ready to be used to begin to tag documents. 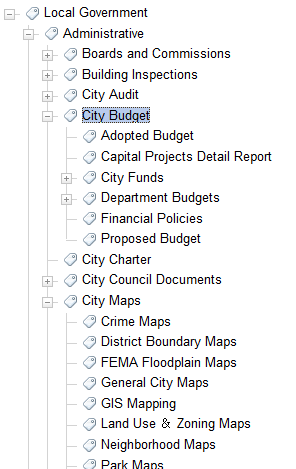 The intuitive hierarchy of local government terminology can then be displayed as intuitive left hand navigation filters in search so that city government users can easily narrow search results and find exactly the content they are looking for. WAND continues to be the industry leader in providing taxonomies to our clients to improve the way that unstructured information is organized, managed, and searched. Local government is just one of many industries and horizontal business topics for which WAND is providing taxonomies to leading organizations around the world. Contact WAND today to schedule a demo of our new Local Government Taxonomy by emailing mleher at wandinc.com. The WAND blog has been quiet in 2013 so far but we have been hard at work and we are going to begin to make a little bit more noise First, today I'm making a soft announcement that we have launched a brand new partnership program called "WAND Within" designed to pair WAND's industry and business taxonomies with leading technologies around the world which are made more powerful and effective with the WAND taxonomies. We will begin to announce the founding WAND Within partners over the next few weeks - it's an impressive roster of names. If a company is a WAND Within partner, it means that the combination of the WAND Taxonomies with the partner technology results in a superior information management experience for the end user. As the taxonomy leader, we are proud to be partnering with best in class technology providers who want to be able to offer our taxonomies as an integral part of their solution. Its a case of 1+1 = 3 and a real win for the customer. Over the next few weeks, we'll also be announcing some new taxonomies that we've been hard at work on, the WAND Local Government Taxonomy, the WAND Wastewater Utilities Taxonomy and the WAND Water Utilities Taxonomy. Stay tuned - 2013 is going to be an exciting year for WAND.